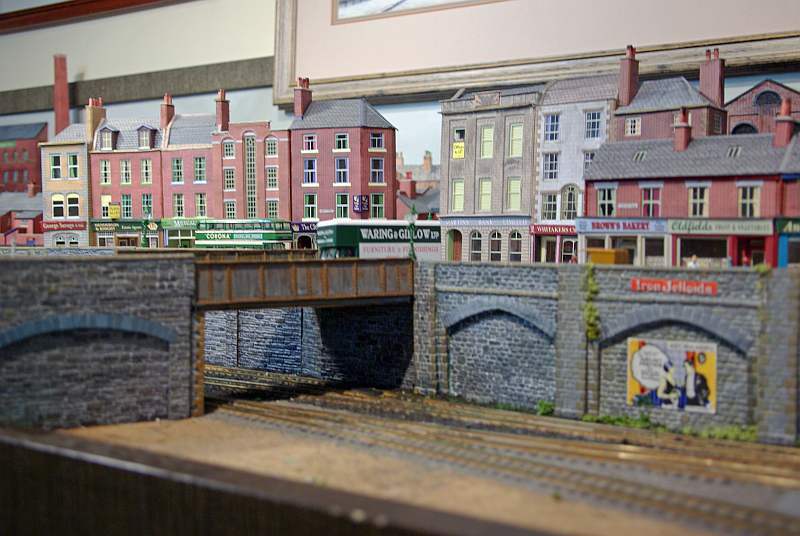 After receiving such a warm welcome I thought I had better start my layout thread on the forum. Although, after looking at some of the layouts here, I have some misgivings because I know I am quite incapable of achieving the skill levels I have seen. I should make it clear from the outset I describe myself as a coarse gauge modeller....I use Peco Code 100 after all ......I tend to use a broad brush approach and strive to suggest an overall atmosphere in terms of time and place although from time to time I do get side tracked into detail . I dont aim for perfection rather I want the layout to look plausible as a whole. I really appreciate feedback where I have got something fudamentally wrong. Operationally the layout is my first attempt at DCC (Lenz), to which I have added RR&Co computor control. I am very enthusiastic about this system and either here, or in a separate topic, I will write about some of my experiences. 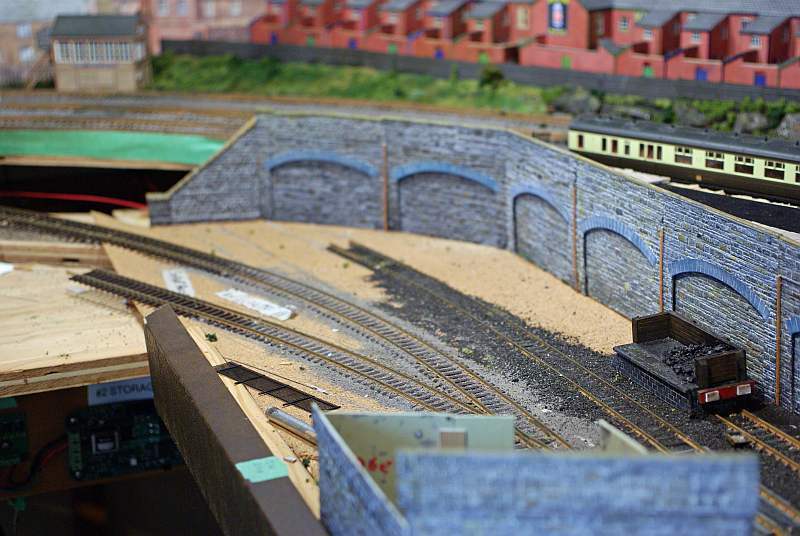 One problem I am not sure how to deal with.....I have had a topic on this layout running in RMWeb for about 18 months describing the progress of the layout to date. While initially I appeared to be talking to myself, I now get a reasonable amount of comment. So I intend to to keep the thread there as well. This means that this thread will be out of sync for a while, until I catch up...........and I guess I run the risk of boring those of you who have read it on the other forum. Anyway I will crash on as quickly as I can. 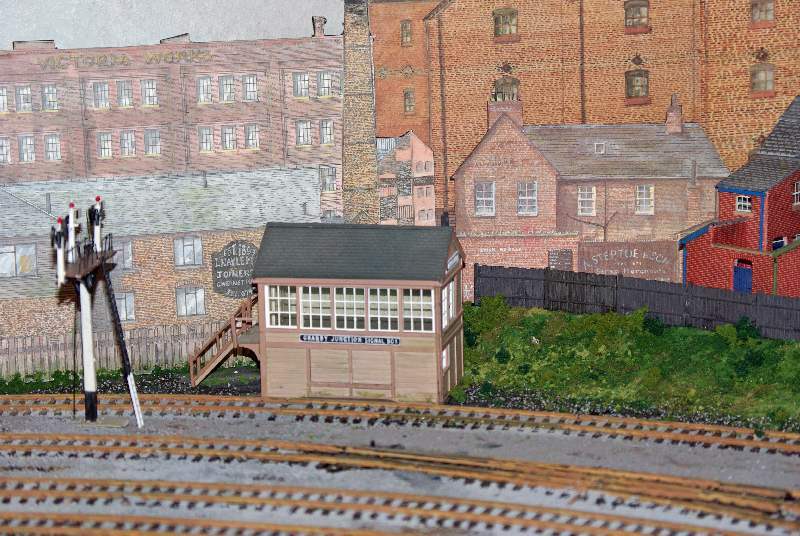 The plan was to have storage yards on the right hand side that would then sweep round to connect on either side with the long left hand section where there will be a medium sized terminus and 8 road engine shed. 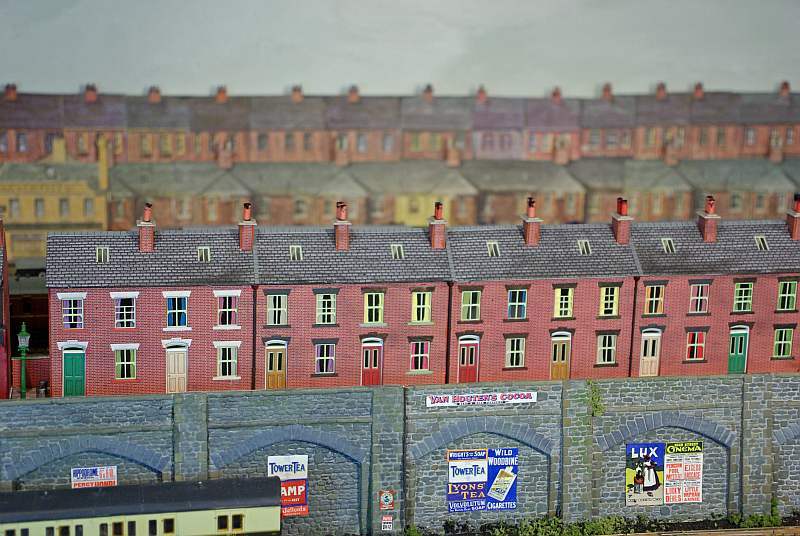 The storage yards are about 24" wide and are fronted at a lower level by an 11" wide branch line. There are 10 roads.......5 up (left) and 5 down (right) but conected so that down trains can enter the up sidings. 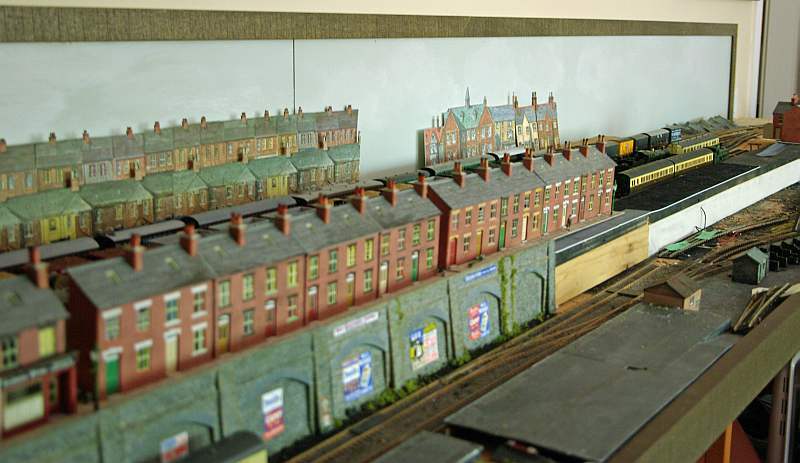 The sidings can accommodate trains of up to 8' in length, although some are divided into smaller blocks of 3' or so. All in all I can accommodate 13 trains of varying lenghts plus 14 relief locos. 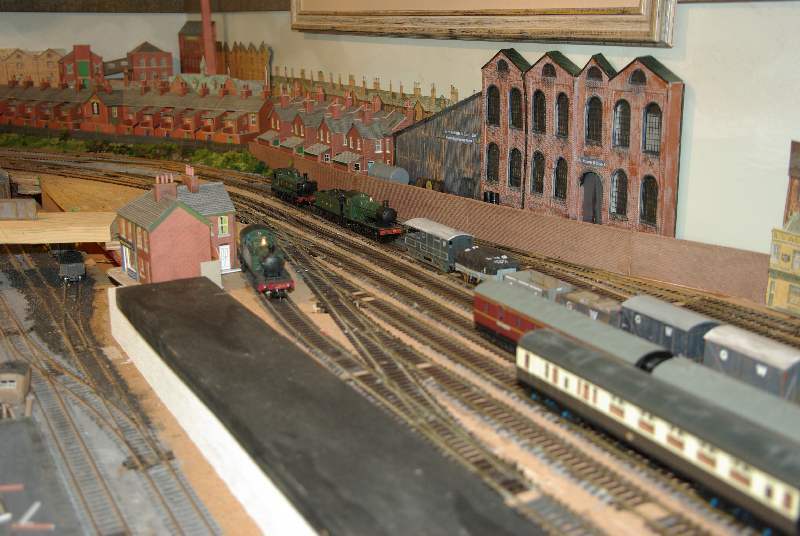 This shows the exit and 3 of the loco spurs.....the space at the side is for a colliery......2011? The shot is fortunately sufficiently out of focus to conceal my less than stellar trackwork! This gives a good idea of the relationship between the branch and the storage area . The loco in the spur is part of the run around routine I described earlier. 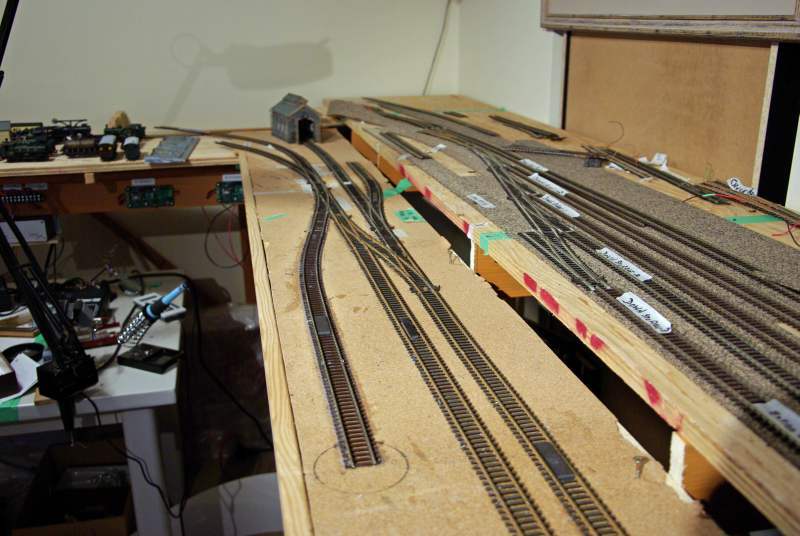 So this is another out of focus shot of the 4 road exit at the Brewery end.....there is very little space because of the planned trackwork at the lower level............so I have to use a flat backscene. 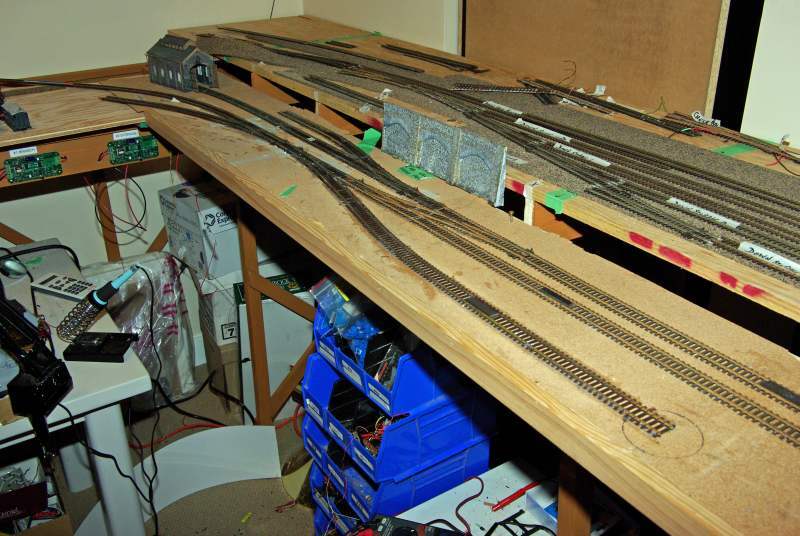 The road is climbing slightly because I decided to make the left hand (terminus boards) 1" higher than the storage yards........enabling me to have a long 2 road storage yard for the branch under the terminus. Its a fairly gentle incline about 1:100 whereas the climb from the branch to the main line.......you can see the start of this in the foreground.....is rather more extreme 1: 40. I am a bit worried about this because although I operate with a minimum radius of 36" the combination of curve and incline may prove a problem for the long (7') coal trains I want to run.......but I wanted to bank anyway! 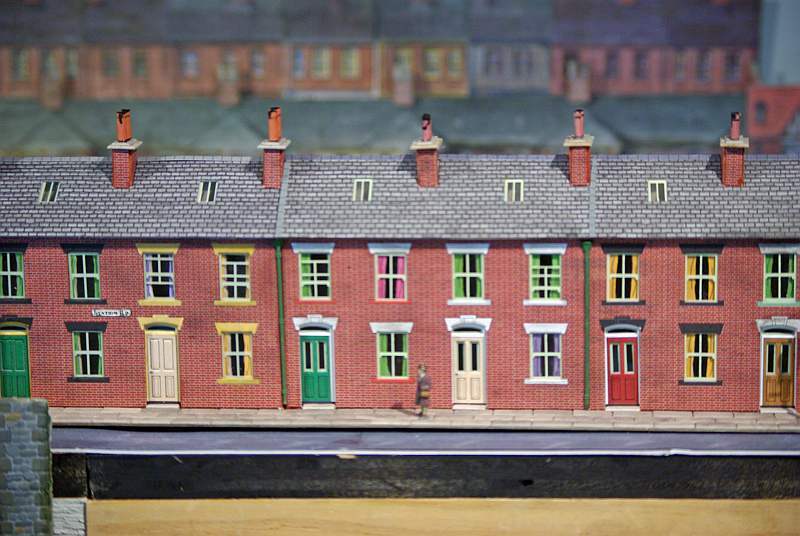 The rear corner is landscaped with Metcalfe Terraced Houses and a Mill and some scatch built items that I salvaged from the last layout. Out of focus again.....stick with me I get better....honest. Since the photo was taken I have moved the flat school bit from the middle.....it doesnt look right......I may eventually drop some more Metcalfe units in......you will see more shots later assuming I havent totally bored you. 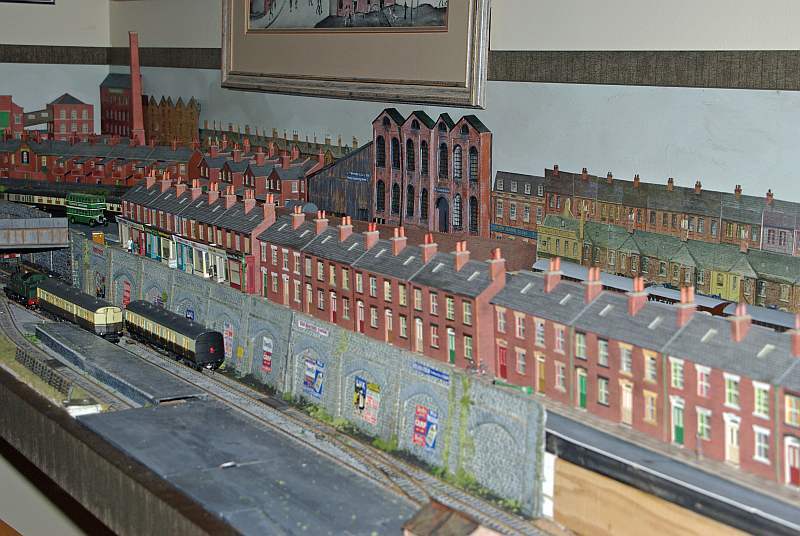 This a stuning layout and another GWR one to boot , never mind we all have our cross's to bear . I like the way you filled the corners and your backscenes. One thing i will say is we never get bored with pics on here so post away. Nice one, John. I'm looking forward to seeing it porgress. 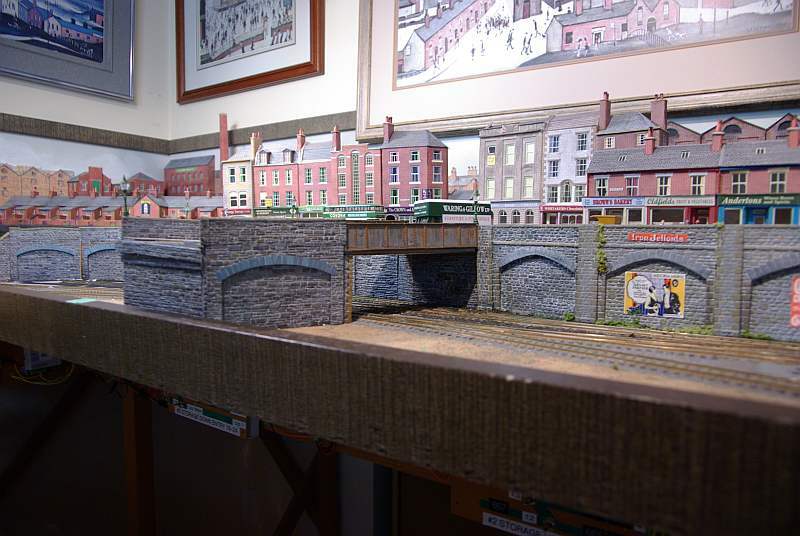 Cracking layout John...coming on a treat.Post as many pictures as you like,we're hungry for as many as we can get....and videos of the action too!!! looking forward to some vids of the system working, if and when you find time. 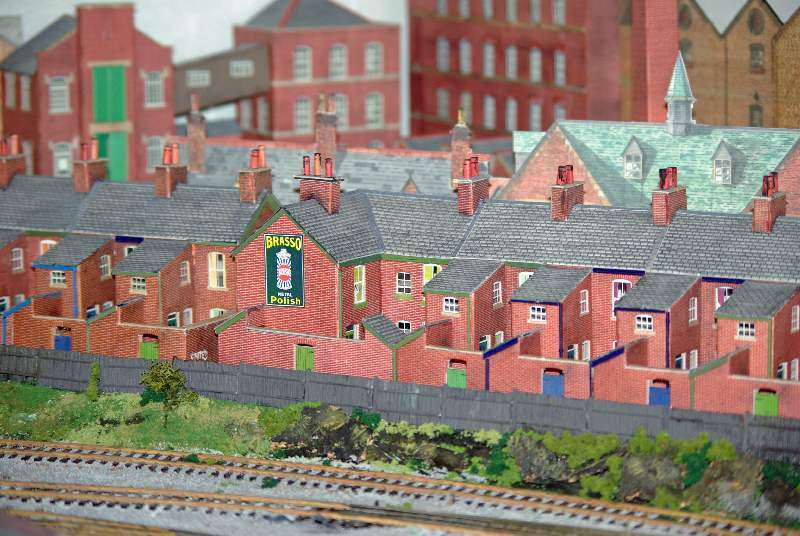 And a lot of work carried out in just over a year, I don't use Rmweb so it I am looking forward to reading your updates regarding the past and also the future developments on the layout. How have you covered the corners of all your Metcalf kits, have you used extra paper or used a coloured pen, as they look a lot better than most I have seen. 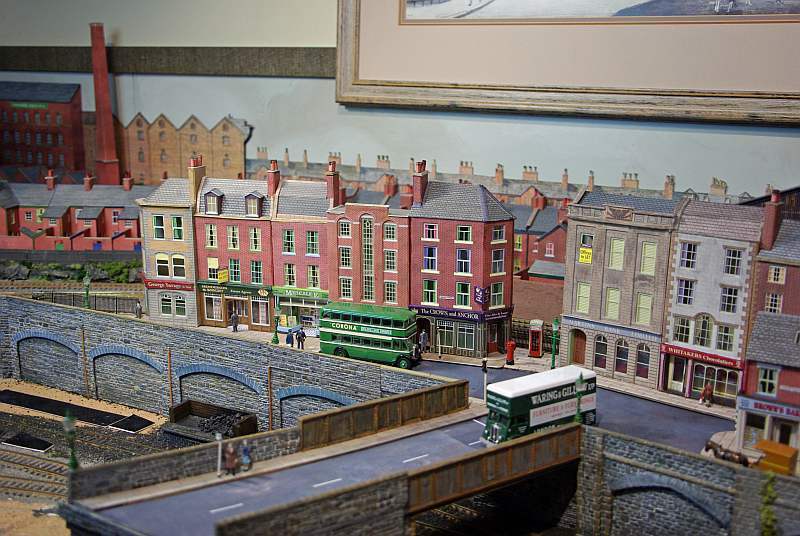 A very nice layout John i can see you like operating trains you certainly have an eye for creating depth of field with how you done your buildings leading to backscenes. It must be a bit of a stretch to reach the back of the thicker sections of baseboard do you stand on something when you need to do that? 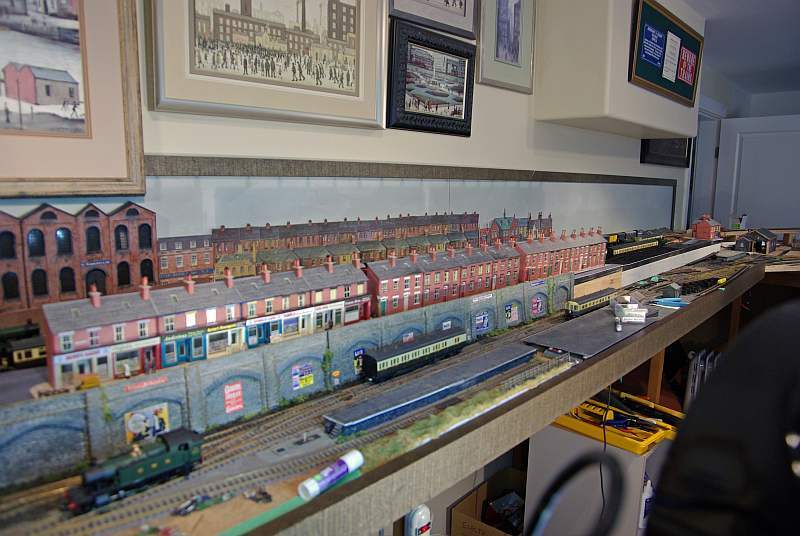 Thats good progress in 18 months especially on a layout that size another 18 months and you should be much further on. 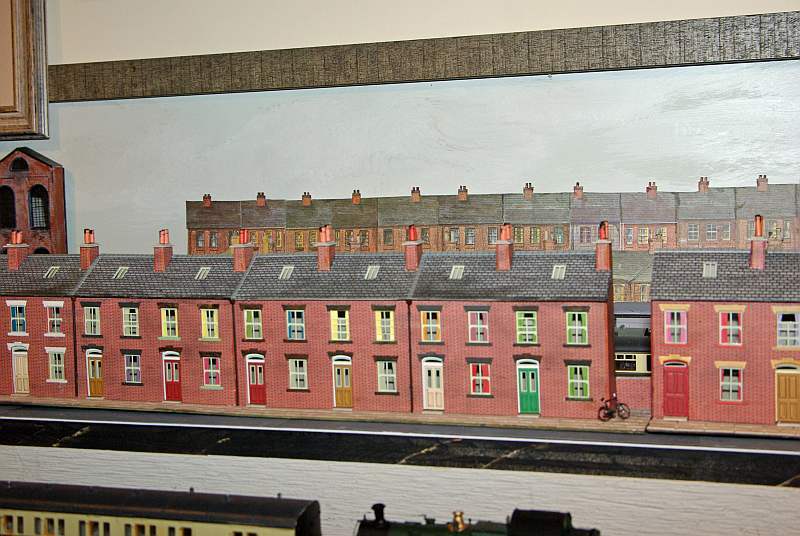 That looks good John and I love those Metcalfe terraces - really good modelling of you town scene. Excellent stuff John, I live those terraces. All in all I can accommodate 13 trains of varying lenghts plus 14 relief locos. Mr. Kohlers investment into new tooling for the Castle class seems money well spent. Or did the GWR not use the Castle class in North Wales? 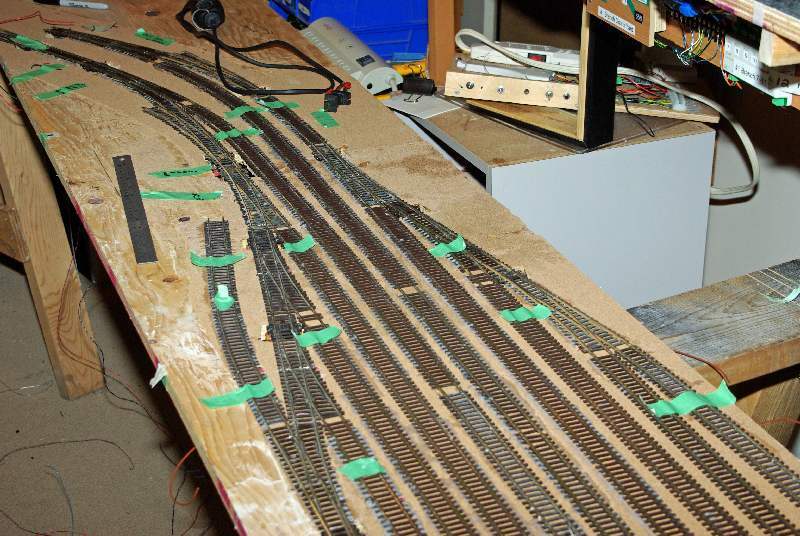 This will be a great layout to watch trains. I am looking forward for lots of pictures to come. And long video sessions of trains running! Thanks for all the kind remarks guys......I normally try and reply immediately but some non railway issues came up. In this post I want to cover the terraced houses and retaining wall that separate and conceal the storage yards from the branch. Metcalfe 1/2 relief terraces. I mount these in modules so they can easily be removed to access the storage yards behind......you can see the break by the bike. 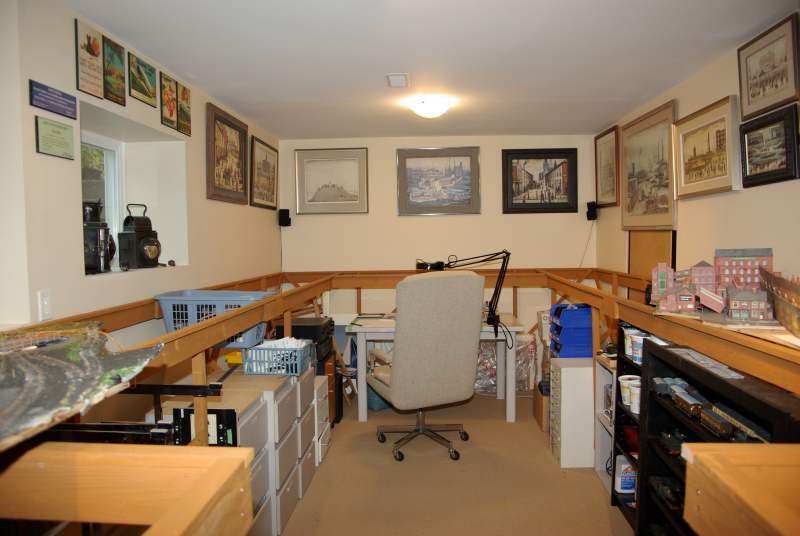 The walls are Langley units......some are 15 years old and this is their 3rd layout. The "Ivy" conceals honourable service scars. 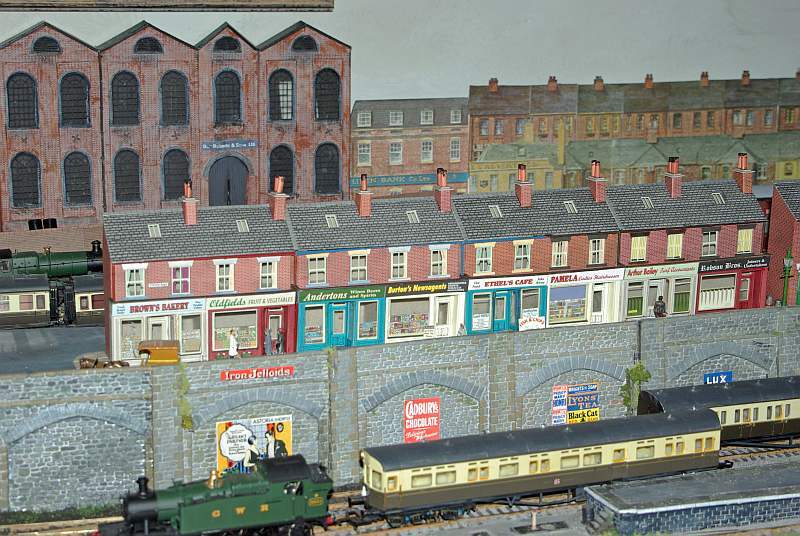 I have mixed feelings about this.....I already had the units so it was very quick and easy but it is again questionable if you would see this in 1947 and you certainly wouldnt in the dirty gritty Welsh mining town I am trying to portray......as I wrote somewhere else too prosperous and too smug........it will have to go sometime. This is the inner corner beyond the bridge.....you can see the bridge support in the foreground. This is the site of the Branch Sub Shed which I will describe next post. 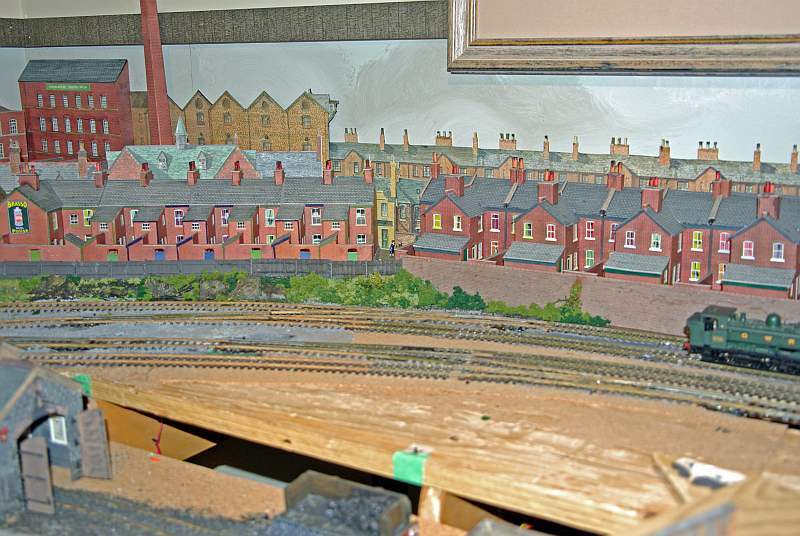 You can see the coal stage,the shed road and a little siding for the Ash Wagon etc. The sharp eyed will not a different style of wall. These are Wills.....I ran out of Langley but luckily the bridge hides the split! So that covered a few weeks work in an hour.....we are up to mid October 2009 now! 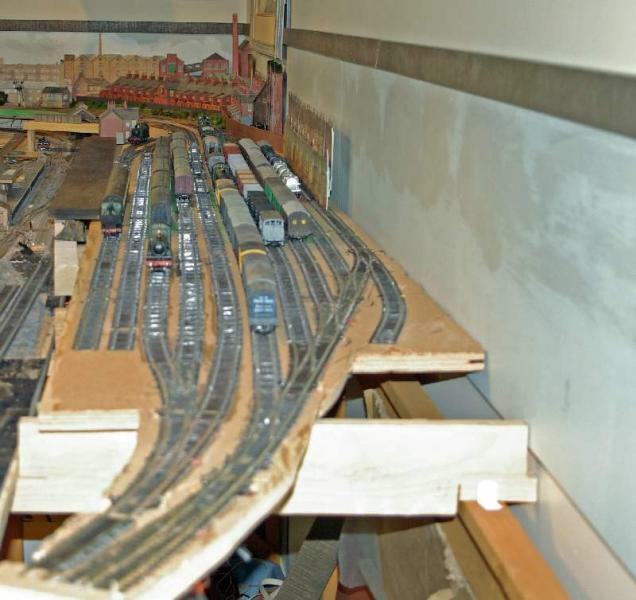 This is one heck of a layout mate, loads to see and still more when you look again. As for you saying that corner you done looks out of place, well with some severe weathering etc it look ok. 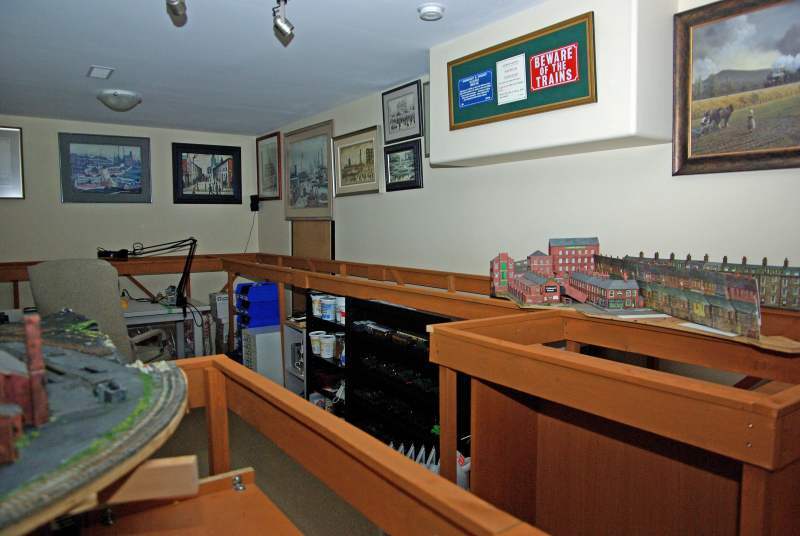 Anyhow as the saying go's its your layout, run and put anything you like on it, . Thanks for the encouragement Phil.........you are either up very late or very early......it must 4 am Thursday in the UK......its still Wednesday here! Great run of photographs, John. It is like I have been around for a visit. John Dew wrote: ....you are either up very late or very early......it must 4 am Thursday in the UK......its still Wednesday here! Well always up by 3am every day, habit i supose. Its Thursday here. Lots of good work there, John. Look forward to seeing your weathering. Particularly like the rusty road bridge panels.